It’s no question that kids are picky eaters. There is no guarantee that when you sit down for dinner that they will want to eat whatever you put in front of them. As a parent, this can cause a lot of stress and frustration. You want your little one to like what they eat, but you also need to provide them with the necessary vitamins and minerals. Instead of giving in and making grilled cheese for what seems like the hundredth time this week, continue reading below for a few meal ideas that your little picky eater is sure to love! Trying to get your child to eat healthy at home is hard enough, but when you take them to day care or preschool, you have no control over what they do and what they eat. At Valley Child Care and Learning Centers, we make it our mission to provide only the very best care for your child. Whether your concerns are about early childhood education, safety, or nutrition, you can rest assured that your child is in good hands. To learn more about our early childhood education program and nutrition policy, contact one of Valley Child Care and Learning Centers’ 10 locations in the Phoenix area today! The key to getting your child to eat a more diverse array of food is to get creative with the foods that you serve. To give you a few ideas, we’ve compiled a few meals that nutritious and are sure to be gobbled up by your kiddo. If your child loves both spaghetti and tacos, what better way to combine the best of both than with a spaghetti taco? With this twist, you combine your favorite spaghetti recipe with your favorite taco shell. Instead of making one or the other (or even both if you have two picky eaters who never want to eat the same thing) you can give your children the best of both in the time it takes to make one meal. All you have to do is make your favorite spaghetti recipe with meatballs or a meat sauce. Once the spaghetti is ready, whip out some hard taco shells and place the spaghetti in the shell. Viola! You have spaghetti tacos that will make your kiddo’s mouth water. 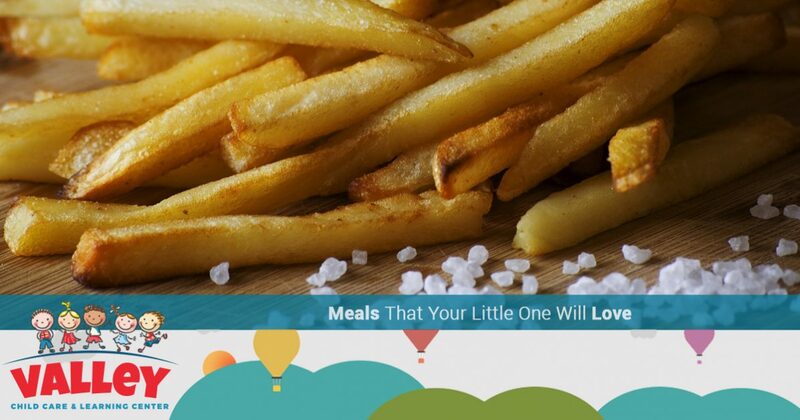 French fries are a favorite among both children and adults, and you can pair them with almost any meal. Whether you’re having burgers, hot dogs, or a sandwich like a BLT, french fries go well with it all! It might be the easiest solution to buy french fries from the frozen section of the store, rip open the package, and bake them in the oven for the required amount of time, but with frozen french fries, you don’t always know what’s going into them. You want the very best for your child, and that includes the best ingredients. If french fries are a staple in your home, then it may be worth it to try and make them yourself! When you make your own french fries, you will be able to control exactly what goes into making them. Not to mention, you can cook your french fries in your oven, making it easy to avoid all of the unhealthy oil of a fryer. Quesadillas are the perfect food for picky eaters, especially if you already know that they like grilled cheese. Not only are quesadillas easy to make, but they are also extremely versatile. You can add ingredients to your heart’s content, making it a great meal for the whole family. Your little one may be a fan of cheese only quesadillas, but because you can make them so quickly, you can easily make a few quesadillas with more ingredients for older children or parents with a more refined palate. Additionally, you can provide different sides that your little one can mix and match or try for the first time. Fresh salsas, rice, and beans are perfect sides for quesadilla night, and you have the power to choose varieties that you know will be appealing to your little one. At Valley Child Care and Learning Centers, we care for your child as if they were one of our own. In addition to providing high-quality early childhood education, we also prioritize your child’s safety and nutrition. To learn more about our curriculums and our nutrition policy, browse our website or contact one of Valley Child Care and Learning Centers’ 10 locations in Phoenix. We look forward to meeting you and your little one soon!